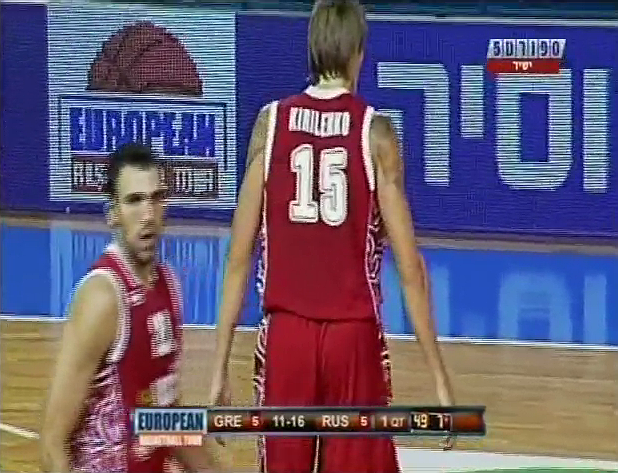 …starring Andrei Kirilenko, with a special cameo from Kosta Koufos (box score). Russian national team head coach David Blatt opted to rest AK in the second of Russia’s three games, and played AK major minutes (game-high 32:16) in the third and last game of the tournament. AK delivered (can’t use that word to describe any Jazzman but Karl Malone) answered with 23 points, 9 boards, 6 assists, and 2 blocks while also drawing 9 of the 21 fouls awarded to Russia. Meanwhile, at the Hellas of Justice, the Koof hit a sweet, high-arcing hook shot and had one foul and one turnover in 3.5 minutes of action. AK, who started at the 4 again, had a difficult time scoring in the first quarter. He made his first bucket–a hoop and harm–but missed the FT. His other FGA in the quarter ended with 1) non-shooting foul; 2) fouled with no call; 3) offensive foul. I think we all pretty much assumed that his back would look plague-ridden, but it’s actually nothing like that at all. The ink is a lot more subtle and translucent than you’d think. 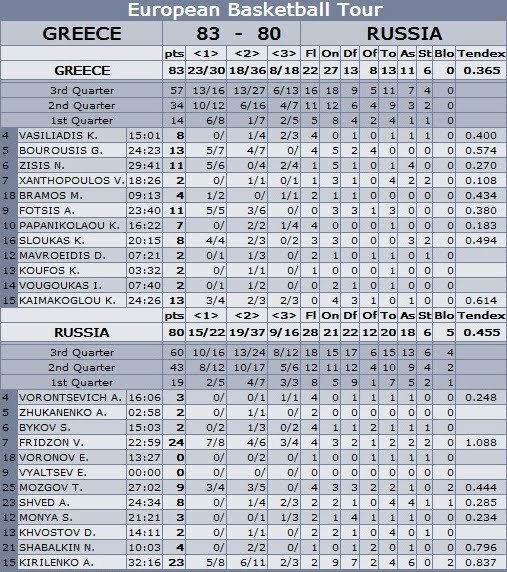 Greece only made 1/7 2-point FGAs in the first quarter and Russia had 5 assists to Greece’s 0, but the score after 1 was 16-9 Russia. AK scored 5 points in the first 1:30 of the 2nd quarter, and the Koof got called for a flagrant on Timofey Mozgov 37 seconds after he checked in. Random observation: They keep showing all these scantily-clad and overly-tanned women in the stands. I assume they’re WAGS. No Masha sighting though. 43-34 Russia at the half, but Greece ties it up early in the 4th after being given four consecutive flagrant or technical fouls (I can’t tell which). After that, it was a really close game with a wild and wacky finish that I’ve included in the video. I have to say, though he did have one great hammer dunk (a real hammer dunk, not one of Boler’s hammers), AK goes up for the dunk far too infrequently and instead opts for layups or double-pump-throw-it-ups. More strength, less flail please. That said, it was pretty cool to see AK being the go-to guy down the stretch. He scored 23 points, but I was most impressed by his passing, i.e. AK’s brand of 50% chance highlight/50% chance turnover dishes. He had one that was an underhanded shovel pass to Mozgov that was thrown from an inch above the floor, and another that was truly threading the needle while trapped between two defenders.